In Rwanda, PWRDF and Global Affairs Canada are co-funding medical training to reduce infant mortality rates. 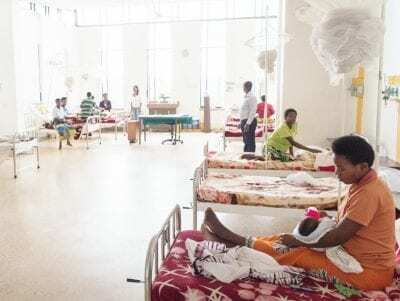 At the Rwinkwavu District Hospital, about 90 km east from the capital Kigali, doctors and nurses are learning how to resuscitate a newborn baby without vital signs, while staying calm. The training gives General Practitioners like Joselyne Uwinkesha, 26, the chance to learn and practise techniques that are typically reserved for specialists. Dr. Uwinkesha graduated from medical school just four months before taking the week-long course. At the end of the session, facilitator Dr. Jennifer Werdenberg, Lead Neonatal and Child Health Technical Advisor and Pediatrician at Partners in Health/Inshuti Mu Bizuma hospital, reviewed the infant resuscitation techniques that had been covered. Suddenly a nurse ran in from the maternity ward and placed a cyanotic, not-breathing, premature infant on the radiant warmer. Dr. Uwinkesha and fellow students immediately grabbed dry towels and ambubags, and Dr. Werdenberg asked her to check the heart rate. Since it was below 100 beats per minute, they started chest compressions. After 20 minutes, the exhausted team reassessed. Despite doing everything correctly, the baby was still not breathing and they had to make the difficult call to suspend interventions. It never gets easier to break the news to the mother that her baby has died, said Dr. Werdenberg. The maternity ward at Rwinkwavu District Hospital..
Dr. Uwinkesha is grateful for the investments the training has made in teaching her not only what to do, but why to do it. The practical simulations and real-life situations helped her feel confident in implementing high-quality neonatal care. Partners In Health/Inshuti Mu Buzima has been a key partner in the development and delivery of neonatal care at district hospitals in Rwanda since 2013. The training and mentorship of healthcare workers in the effective implementation of the Rwanda National Neonatal Protocol is key to saving babies’ lives.